What is a Smart Home, and How Does It Work? Why are Smart Home Features Gaining in Popularity? Imagine this scenario: You come home from work and your front door, sensing your presence, automatically unlocks for you. You walk in, carrying bags of groceries, and as you enter the kitchen, the lights turn themselves on. You put your groceries away and realizing that you forgot an item, you send a request to your grocery store for a delivery using a touchscreen built right into the refrigerator. You settle down in the living room to watch television. Sensing that you’re slightly chilly from information gathered from your smart watch, the thermostat automatically increases the temperature of your home to keep you comfortable. You go to bed at 10:30, like always, and as you pull the covers up over your head, your bedroom lights automatically dim. If you listen carefully, you can hear the click of your doors automatically locking for the night. Does this scenario sound like a scene from a futuristic sci-fi movie? Believe it or not, the technology described above already exists, and can be retrofitted into almost any home in America with the expertise of the right contractor or solution provider. Across the country, individuals are implementing such smart home solutions to lead more comfortable and convenient lives. Not only accessible to the mega-rich, a self-adjusting thermostat, or a security system that can be controlled from your mobile phone, are now budget-friendly additions that nearly anyone can have. Perhaps some of the greatest opportunities that smart home technology offers are for the elderly and the disabled, for whom living at home can pose daily struggles. Thanks to smart home technology, seniors and disabled adults are able to live in their own homes with less fear or restriction, giving them a sense of freedom and confidence they have been missing for years. This guide was designed to provide a thorough understanding of the latest smart home technology, and suggestions for specific software and devices that can be incorporated into a home to accommodate each of seven of the most common types of disabilities: hearing difficulty, vision difficulty, speech/language difficulty, cognitive difficulty or memory loss, ambulatory difficult, arthritis, and self-care/independent living difficulty. If you or a loved one struggle with daily home living due to a disability, this guide will offer inspiration and actionable advice for opportunities to make your home life more comfortable and convenient through use of the latest smart home technology. To help you plan, no matter your financial situation, we’ve indicated for each product if the solution will accommodate a low ($), moderate ($$), or high smart home budget ($$$). The term smart home covers a wide range of home-based technology that is integrated between devices using an Internet connection. From the home dweller’s perspective, a smart home provides comfort, security, safety, accessibility, energy efficiency, and convenience through the use of appliances, lighting, electronic equipment, heating and cooling systems, entertainment systems, and home security solutions. In a smart home, all such devices can be controlled remotely by any desktop computer or mobile device with Internet access, or preset using a pre-defined preferential schedule. They can even be customized on a room-by-room basis. Many smart home solutions can also accept voice commands for the ultimate in-home convenience. Smart homes are becoming a large component of a digital phenomenon known as the Internet of Things (IoT). The IoT refers to all those devices that are interconnected and identifiable to one another through digital networks. Think of your smart watch talking to your home security system via the Internet. As technology continues to advance, it’s predicted that such interconnectivity will become the norm, and will continue to be a necessity for individuals who struggle with daily home-related activities due to age or disability. Believe it or not, the catalyst for smart home technology preceded the twenty first century. It all began in 1975 when a Scottish company developed a product known as X10. X10 allowed compatible products to “talk” to one another using a home’s electrical system. The X10 allowed for such conveniences as turning off a lamp in the bedroom while seated in the living room. Though using what we would today consider a primitive technology system, fundamentally the X10 aimed to deliver many of the conveniences smart home technology companies aim for today. At one time, smart homes and smart home devices were thought to be only obtainable by the wealthy, and only desirable by the tech-savvy, such as Bill Gates who spent over $100 million building his smart home outside Seattle, Washington. Aside from interest in smart home features purely for the cool-factor that they offer digital-trend setters, smart home technology is gaining in popularity among those who want to optimize their home to ensure safety, energy efficiency or leverage technology to overcome the hurdles of home-living in the face of a disability. Another reason smart home device use is on the rise, is due to the proliferation of new, interconnected technology. Some of the most advanced technology companies are finding ways to connect such everyday devices as thermostats and stereo systems to the IoTs. Such availability of products is making it affordable and convenient for the average home owner, or the special needs home owner, to bring smart technology into their home. For many years, the pinnacle of smart home innovation was Bill Gates’ $100 million creation. At Gates’ smart home, everyone is pinned with an electronic tracking chip. As one travels through the home, lights turn on ahead of you, and fade as you leave a room behind. Your favorite music, or the television show you’re watching, will follow you from room to room. Perhaps most impressively, if two individuals enter the same room, the smart system will attempt to compromise on settings it believes both occupants will enjoy. 1975 – ¬X10 is created in Scotland to connect devices with one another. 2010 – Nest, the Wi-Fi connected thermostat is introduced to the market. 2012 – The app SmartThings is launched on Kickstarter. By 2013, it had shipped more than 10,000 hubs. 2013 – Smart home devices dominate at the Consumer Electronics Show (CES), the biggest international tradeshow focused on consumer electronics. 2015 – Such smart home innovations enter the market as the self-watering (and talking) flower pot, and a Wi-Fi connected coffee pot. To date, there have been no standard regulations for the automation of home devices, leading some to hesitate before smart-retrofitting their homes. There is also no overarching governing body, making some fear the consequences of a smart home hacked by cyber extortionists. There are some entities attempting to offer guidance to developers and tech companies, however. The IEEE Standards Association (IEEE-SA) is a leading consensus building organization that nurtures, develops and advances global technologies, through IEEE, the world’s largest technical professional organization dedicated to advancing technology for the benefit of humanity. In addition, Zigbee is a non-profit organization that serves as the only open, global wireless standard to provide the foundation for the IoT by enabling simple and smart objects to work together to improve comfort and efficiency in everyday life. The ZigBee Alliance is an open, non-profit association of approximately 400 members working to drive development of innovative, reliable, and easy-to-use ZigBee standards. Vision difficulty, including blindness or having serious difficulty seeing, even when wearing glasses. Cognitive difficulty, including Alzheimer’s disease, dementia, or memory loss. Ambulatory/walking difficulty, including having serious difficulty walking or climbing stairs. Self-care/independent living difficulty, including difficulty dressing, bathing, or getting to/from doctor’s appointments or errands. For each of the disabilities listed above, what was once an incapacitating disorder that made living independently in one’s home nearly impossible, life-simplifying smart-home technology advancements are allowing individuals to remain comfortably, and safely, in their own homes—where they most want to be. What follows are smart home solutions that can make independent living possible for each of the previously listed disabilities. No matter the budget. A smart home convenience that can add comfort and reassurance to the home of a hearing-impaired resident is the installation of a colored light notification system. To help alert the hearing impaired of a variety of scenarios, the latest smart home innovations blink, and even use a series of colors to signify different types of alerts. For example, you may be able to customize your home so that your lights blink orange when a stranger arrives at your door, or purple when a specific family member comes home, or blink blue to indicate laundry is done. Such alerts help the hearing impaired to maintain a self-sufficient home environment. Such lighting systems are available with a variety of features, from voice-controlled dimming (working in conjunction with Amazon Echo’s Alexa), while others allow for more customized color notification programming. They range from around $30 for a voice controlled dimming light to $200 for a complete set with greater capabilities. Pros Colored lights can notify you of a variety of pre-defined home needs. Cons The bulbs are more expensive than traditional light bulb, and also require the purchase and installation of a hub device. Customizations Some systems allow you to customize what each flashing color indicates, allowing you to lead a more informed and confident home life. Product Considerations Some brands, such as the Philips Hue, can integrate with smart home hubs, such as the Amazon Echo. If you plan to integrate your lights with existing systems, make sure the brands you choose are compatible with your existing equipment. Installation Some customization and personalization may be required to set color preferences, or to tie into a smart home hub, however professional installation should not be required. A variety of smart doorbells have been designed to assist the hearing impaired. Some integrate with smartphone apps and can alert a hearing-impaired individual when someone is at the door by causing the phone to vibrate or blink an alert light. Taking the concept one step further, a camera doorbell allows an individual to see who is on the other side of the door by sending a camera feed to a smart phone. Through an interconnected speaker system, the homeowner can also speak to the guest. In the case of seniors with hearing loss or mobility issues, this allows them to ask their guest to wait while they make their way to the door. An alternative smart doorbell option functions through the use of audio frequency waves. These products emit a sound on a unique frequency that can be detected by the deaf. Perhaps the most fully functioning products add an additional security component by adding a motion sensor to detect activity outside the home. Such features help protect the hearing impaired from the threat of a home break-in by alerting the home owner with a smart phone alert when it’s detected that someone is outside the home. Pros Smart doorbells can offer the hearing impaired the comfort and security of knowing they are protected from intruders, and that they won’t miss an important visitor. As an added security feature, a homeowner can turn on the doorbell camera to check on the house at any time. Cons Most, with the exception of the audio frequency options, require integration with an existing smart phone. Customizations Some smart doorbells can be integrated with home security systems, allowing you to give a voice command to unlock the door if you’ve been notified of a visitor, and have confirmed visually that it’s someone you want to let into your home. Product Considerations Budget may be the most significant factor when deciding which smart doorbell to select. Most smart doorbells are available for a few hundred dollars, depending on their features, although stand-alone audio frequency doorbells are typically the least expensive. If you have a smart home hub that connects multiple smart home products, you may want to choose a doorbell that can integrate with your hub. Installation If you choose a more complex system that requires integration with a home security system, you may want to consider professional installation. Also Benefits Those with mobility issues. To enable the deaf or hearing impaired to more easily participate in dialogue with those who do not speak sign language, UNI is a smart assistive technology gaining popularity and support on the crowdfunding platform Indiegogo. The product, which is designed in the shape and size of a tablet, detects hand and finger gestures with a special camera algorithm that converts the sign language into text for the non-hearing impaired. It is also equipped with a microphone that converts speech into text to assist the hearing impaired. When both participants in the conversation are using an UNI device, they can carry on a meaningful conversation. The device sells for about $200. Pros UNI does not require Wi-Fi to use the sign-to-voice and voice recognition features, which means it can be used even when Wi-Fi is not available. Cons UNI is not yet available via mainstream retailers. To reserve an UNI device, visit the company’s page on Indiegogo. Also, in addition to the purchase price, UNI requires an annual subscription, which means you will be subject to ongoing costs. Customizations UNI allows a user to save custom language to its dictionaries to personalize the experience for the user. UNI also remembers your movements to constantly improve its translations. Product Considerations UNI is only compatible with English and American Sign Language. If English or ASL are not the primary languages of the intended users, UNI will not be a viable communication option. Installation There is no installation required for UNI, just the need to learn its interface and capabilities. The visually impaired still enjoy listening to their favorite television shows, however managing television equipment and interacting with standard visually based interfaces can be impossible. New innovations in entertainment systems offer the visually impaired the ability to change channels with voice commands and listen to a talking guide. Pros Independent management of home electronics. Cons Functionality is typically limited to searching for content, and does not assist with other needs, such as volume or power control. Product Considerations Solutions are available from Apple TV, Samsung, and Comcast. The decision for which system to choose may depend on your other home electronics and their compatibility with one another. Installation Assistance will be needed to set-up the hardware and, if applicable, integrate the device with the home internet system. Also Benefits Those with mobility issues or arthritis. Devices such as Amazon’s Echo with Alexa, the Apple Home Kit, Google Home, or SmartThings offer home owners the ability to give voice commands in order to access information or control a variety of integrated home devices. For a modest fee, a smart home device can be set up to command a variety of smart home devices, such as home security systems, home entertainment systems, and thermostats, using voice commands—an ideal capability and ultra-convenience for the visually impaired. With a smart hub, a vision impaired home owner could request to hear a summary of the latest news, or ask for a timer or alarm clock to be set. By integrating your smart hub with other smart phone devices, oral commands can be given to lock the doors, turn the television on to a specific channel, or turn the lights off in the room. The Amazon Echo retails for about $180, and the Google Home retails for about $120. Additional smart home devices are sold separately. Pros Can act as a stand-alone device or as a smart home hub when paired with other compatible smart technology. Cons Each hub product is compatible with a different set of smart home devices, so if integration is desired, research will be needed to determine which devices can integrate with one another. Customizations For the tech savvy, some smart home hubs can be customized further, as the Amazon Echo provides a channel on IFTTT, a free online automation service that lets individuals craft their own automated command preferences using an “if this, then that” logic. Product Considerations Depending on your home and interconnectivity needs, plan to research the capabilities of each type of device to choose the brand that suits your needs. Currently, the Echo integrates with more smart home device brands. While Google integrates with August, Belkin Wemo, Frigidaire, Honeywell, Insignia, Lifx, Logitech Harmony, Next, Philips, Rachio, Samsung, TP-Link, Wink, and anything with a Chromecast attached to it, the Echo supports all of those except Chromecast, as well as Blink, Carrier, DigitalStrom, Haiku, Leviton, Lowe’s Iris, Lutron, Netatmo, and many others. Installation Setting up a stand-alone smart home device does not require hard wiring or complex integration; however technical assistance may be needed if you intend to customize your smart home hub to help you command other smart home devices. Also Benefits Those with mobility issues, or arthritis. The Dot Watch provides the visually impaired with the freedom to communicate and live more independently. It is the first Braille smartwatch and it can connect via Bluetooth to any smartphone, then retrieve and translate text into Braille on the face of the watch, one letter at a time. It can notify the wearer of emails, tweets, or even allow him to read a book, in addition to, of course, telling time. While much less expensive than most braille readers, the Dot Watch will retail, once available, for about $290. Pros Allows the wearer to read incoming messages, emails, tweets, and books. Cons The Dot Watch is still in production and is only accepting pre-orders. The initial release will only be available in English and Korean. Customizations The initial launch will not offer customization. Product Considerations The primary consideration for a visually impaired individual considering at Dot Watch is if they would prefer to read messages in braille, or use a device that can speak incoming messages, such as a smart phone or smart home hub. According to the National Institute on Deafness and Other Communication Disorders (NIDCD), approximately 7.5 million Americans have trouble using their voices. The causes are far ranging. Spasmodic dysphonia, for example, is a voice disorder caused by involuntary movements of one or more of the muscles in the larynx that can affect anyone. Women between the ages of 30 and 50 are particularly susceptible to the condition. In addition, Laryngeal papillomatosis, a condition in which tumor grow inside the larynx, though rare, can severely impact speech as well. Another cause of speech disability includes cleft palate, the fourth most common birth defect and one that impacts one out of every 700 live births. Speech disabilities sometimes accompany hearing loss, particularly in cases where an individual is born with a hearing disability, or develops one at a young age, and the development of speech capabilities is impeded. Whether an individual experiences speech disability alone, or it is accompanied by hearing loss, they face unique challenges in managing their day-to-day lives. What follows is a smart home solution for the speech impaired. Talkitt is an application that helps individuals with speech impediments to better communicate with those around them by translating unintelligible pronunciations into understandable speech. The device works in any language. Currently, the initial device, plus a three-year subscription, can be purchased for $250. Pros Allows the hearing impaired to better communicate with others who may not be able to understand them due to a speech impediment. Cons Talkitt is not yet available for purchase through traditional retail. It is still in the process of generating funding through Indiegogo. Talkitt will require an annual subscription, so after initial purchase, additional fees will apply. Customizations Talkitt recognizes patterns in an individual’s speech and creates a personal speech dictionary for the user to produce more accurate translations over time. Product Considerations Only one version of Talkitt will be part of the initial launch. In the future, the brand intends to make its application available on desktop computers and wearable devices. Installation No installation is required. Talkitt can be downloaded onto any smart phone or tablet. According to the CDC, 10.6 percent of Americans have a cognition disability. Adults 45 to 64 years of age are more likely than any other age group of adults to report a cognitive disability. In addition, memory loss, dementia and Alzheimer’s are serious condition that impact seniors, making it extremely difficult for them to safely live independent lives as their cognitive abilities deteriorate. Alzheimer’s disease is a degenerative brain disease and is the most common cause of dementia, a condition characterized by a decline in memory, language, problem-solving and other cognitive skills that impacts an individual’s ability to perform everyday activities. Fortunately, thanks to advances in smart home technology, more seniors and individuals with cognitive disabilities are able to live in their own homes, and more independently, longer. Below are some innovations helping keep those with cognitive difficulty safe and comfortable at home. One of the greatest concerns for patients with cognitive disabilities is the fear that if not properly cared for, they will fail to take proper care of themselves. There are plenty of low-tech Telehealth and other software systems that can help organize medication schedules, but thanks to a new device called Lively, family members and caregivers are able to better monitor those with cognitive disabilities—remotely. With Lively, sensors are placed around the home that learn an individual’s normal routine for such activities as taking medications, sleeping, eating, as well as their typical activity habits. The information is captured by the sensors and interpreted by the Lively Hub where it is sent to a website. Caregivers and family members can refer to the patient’s Lively web portal to view activity. Most importantly, Lively will ping notifications if it determines abnormal or unsafe activity. Lively sensors can be attached to a refrigerator to ensure the patient is eating properly, to pill bottles to ensure medication is being taken at the right times, or to a set of keys to monitor time out of the house. Currently, the Lively system retails for about $50. Pros Thanks to the integration with the Lively Hub, a Wi-Fi connection or home network are not needed. Cons Some users have reported inconsistent effectiveness of the device sensors. Customizations Lively learns patterns in an individual’s behavior so that if abnormal behavior is identified, caregivers can be alerted. Product Considerations Only one version of Lively is available at this time. Installation Installation is easy and simply requires set up of the sensors, plug in of the hub, and learning how to interface with the website. Also Benefits Those with a self-care disability, or mobility issues. As memory begins to decline, one of the most common daily frustrations is remembering were important home items have been left, such as house keys. A key finder typically works with a Bluetooth device and can be connected to a smart phone to help identify the location of lost keys. A wide range of products are available that start at $8, and increase to $60. Pros Most key finders can be attached to more than just a set of keys to help keep track of a variety of important home items. Cons In most cases, if you are caring for someone remotely, you’ll need to be in close proximity to help them locate lost keys using the smart phone paired to the tracking device. Customizations Some products offer geofencing, which means you’ll receive an alert if your keys travel outside a pre-set range. Product Considerations Some options, such as the Track Bravo can be integrated with a smart home hub. Also, various products have different ranges, so depending on the size of your home or property, be sure to choose the product that best suits your anticipated needs. Installation No installation is required, just pairing with your mobile device. The CDC estimates that 13 percent of Americans have a mobility disability. Mobility challenges can stem from a variety of causes, including birth defects, amputations, general age-related impairments, or injuries. For someone who has developed an injury, one of their greatest fears is the loss of their freedom, and the worry that they will no longer be able to live independently in their home. A variety of smart home solutions are helping those with mobility issues remain in their homes and live capable, independent lives. For homes not previously built to accommodate someone in a wheelchair, day-to-day activities as simple as turning light switches on and off can become daunting tasks. Now, there are smart home solutions that will connect home electronic systems to the Internet, allowing lights to be controlled from a smartphone. This includes lighting, window blinds, pet feeders, air conditioners, washers and dryers, sprinkler systems, ovens, and thermostats. Pros Those with limited mobility can interact with essential home devices from the safety of a wheelchair, or without the fear of a fall. Cons For some, the availability of a variety of interconnected devices becomes difficult to manage when each requires the use of a separate mobile phone app. For many, this is the benefit of choosing devices that can integrate with a single smart home hub device. Customizations Depending on the device, some can be programmed to perform specific activities at certain times (like turn your bedroom lights on every day at 6 a.m.), or can learn your preferences over time. Product Considerations A growing number of manufacturers are entering each category of interconnected home electronics. Choosing the product that is right for you will depend on your budget, your needs, and whether or not the device needs to integrate with a smart home hub. Installation Installation varies by product. A pet feeder, for example simply needs to be plugged in and tethered to your Wi-Fi, while a sprinkler system will require professional installation. Also Benefits Those with a self-care disability, or arthritis. Smart home locks security systems give individuals with mobility issues the comfort of knowing that they are safe in their own home. A range of products is available. Basic models allow an individual to lock and unlock doors using a smart phone, a convenience for individuals for whom walking across the home to lock and unlock the doors throughout the day can be a challenge. More sophisticated systems offer more complex home monitoring and capabilities that allow you to turn lights on and off, lock doors, and view video cameras no matter where you are in the world, as long as you are connected to the Internet. Pros The convenience and comfort of knowing you can maintain a safe home. Most products integrate seamlessly with most deadbolts. As an additional security feature, you can choose to be notified if your door opens, even if you’re not at home. Cons Some smart home security systems require a contract in order to utilize their full surveillance capabilities, so make sure ongoing costs factor into your budget. Customizations Some products can be customized with a preferred schedule, so that doors lock and unlock at the same time every day, depending on your needs. You can also set some products to automatically lock your door if it has been unlocked for a predetermined amount of time. Product Considerations Depending on your needs and your budget, choosing the right product will mean deciding if you simply need to lock and unlock doors using a smart phone in order to accommodate mobility difficulties, or if you need more robust security and surveillance services. In addition, some smart home locks and security features can integrate with other smart products, such as a smart home hub. If integration is essential to you needs, be sure to choose a product that is compatible with other products in your home. Installation Depending on the system you choose, you may need both technical set-up assistance, and professional installation. Many smart home devices function with smart phone integration, yet for those who suffer from mobility issues, the ability to use a touch screen may not be possible. To assist those without the control of their hands, the Sesame Phone accepts commands using small head movements tracked with a front-facing camera. Head movements mirror typical touch movement. For example, gesturing to the right tells the device to swipe right. A nod may tell the device to play. The Sesame Phone retails for $1200. Pros Sesame Phone can also function with voice commands. Sesame Phone is only compatible with Android apps. Customizations By integrating the Sesame Phone with other smart devices, or with a smart hub, the phone can be used for more than just phone calls. It can be used to control other smart home devices, such as home electronics, or the thermostat. Product Considerations Sesame currently only utilizes the Google Nexus phone for its hardware. If you currently utilize an iPhone that is integrated with other devices, switching to an Android phone may result in other integration issues. Installation No set-up is required. What may seem like an inconvenience, is truly a disability for the millions of people living with the pain and limited mobility that accompanies Arthritis. According to the CDC, from 2013 to 2015, an estimated 54.4 million U.S. adults annually had been diagnosed with a form of arthritis, rheumatoid arthritis, gout, lupus, or fibromyalgia—all conditions that cause severe pain and limited movement, and can make basic household chores a challenge. While many of the solutions available for individuals with mobility issues can benefit those with Arthritis, such as Internet controlled electronics, in addition, the product below can benefit those living with this chronic pain condition. Oral health is important to overall health, yet for individuals living with arthritis, the simple act of vigorously brushing their teeth can be a challenge. Now smart toothbrushes are making oral care easier for those with grip and coordination issues. Smart toothbrushes provides much of the brushing action necessary with less manual movement, helping to ease discomfort for those with joint pain. Pros Smart toothbrushes have built-in pressure sensors and timers for optimal oral health. Cons Even though most smart toothbrushes are affordable and can fit most budgets, they are more costly than traditional products, take up more space, and require regular charging. Customizations Speed settings allow you to accommodate your personal sensitivity needs. In addition, those with an integrated app allow you to optimize your brushing habits. Product Considerations A wide range of products are available, at a variety of price points, sizes and weights. Choose the product that fits your budget and is most comfortable in your grip. Also Benefits Those with a self-care disability, those with mobility issues. It’s estimated that 6.5 percent of Americans have an independent living disability, and 3.6 percent of Americans have a self-care disability. For those struggling with such disabilities challenges may range from an inability to dress oneself, to an inability to grocery shop, run errands, or take oneself the doctor. Of particular concern for seniors, self-care disabilities may be accompanied by cognitive, ambulatory, hearing, or vision disabilities, further necessitating the support for accommodations and devices that can enable one to live a more independent life, at home, for as long as possible. assist-Mi is an assistance application that helps disabled individuals to get assistance in real-time by connecting service providers and caregivers with disabled individuals who may need transportation help at a moment’s notice. For individuals with a self-care disability, assist-Mi enables them to find a nearby caregiver who can assist with the types of activities they are unable to do on their own, such as traveling to work, going shopping, or running errands. Pros Improves the daily lives of people with a self-care disability by connecting them with nearby caregivers. The app also provides a directory of accessible nearby service providers, such as retailers and facilities for convenient reference. Cons The app works by connecting the disabled with nearby caregivers. If you live in a more rural area, your options for nearby caregivers may be limited. Similarly, depending on the exact time you need assistance, there may not be someone nearby available to assist. Customizations Smart location-based technologies personalize the experience so that those in need are paired with nearby caregivers. In addition, a user can create a custom profile and save personal preferences. Product Considerations assist-Mi primarily enables disabled individuals to obtain transportation assistance. If in-home care is the primary concern, such needs may be beyond the scope of the assist-Mi application. Budget $ The app is free from the iTunes® App Store and Google PlayTM Marketplace. Also Benefits Those with mobility issues, the vision impaired. While the most advanced refrigerators offer the average, able-bodied individual convenience, for those with self-care needs, they offer a much-needed health benefit. The most advanced models of Wi-Fi enabled refrigerators have built-in cameras that allow you to see what’s inside the refrigerator without opening the door. You can also leave notes and appointment reminders on the refrigerator’s front digital display—a convenience for those who may also suffer from memory loss. Perhaps most impressive of all, smart refrigerators will keep track of your re-stock needs and allow you to send a grocery list directly to a participating grocery store (such as Whole Foods, Fresh Direct, or Shop Rite), for delivery right to your door. Such conveniences enable home-bound individuals to be able to remain well cared for in their own home. Pros Thanks to the re-order and delivery functionality, home bound individuals don’t need to be reliant upon caregivers to help restock their food. Cons Not every grocery store offers online ordering and delivery. Depending on where you live, the ability to re-order products may not be feasible. Customizations For products with built-in on-screen apps, you can keep track of notes, calendar items, appointments, and grocery needs, helping you to personalize the product and it use. Product Considerations Budget may be the biggest consideration when choosing a smart refrigerator, since product features and installation costs range greatly, even more so than installing standard appliances. In addition, some brands integrate with smart home hubs. If you need to integrate your refrigerator with your smart home hub, be sure to choose a compatible system. Installation Assistance will be needed to bring the large refrigerator into the home. Depending on your technical aptitude, you may need assistance pairing it to your Wi-Fi and setting your preferences. Budget $$$ While a variety of products are available with features that range in complexity, most costs range from $1300 to $6,000. Also Benefits Those with mobility or cognitive disabilities, those with arthritis. For some, the addition of a few smart devices into the home could make all the difference needed to live independently. For others, the greater need is for a more integrated and robust use of the IoT to make a wider variety of home activities feasible. For still others, depending on their needs and the complexities of their disability, what is needed to keep them in the home where they belong may be a fully customized home environment. TechHomes.com – Offers a state-by-state directory of smart home communities, builders, and resources. RISE – Founded by actor Gary Sinese, RISE (Restoring Independence Supporting Empowerment), builds adaptive homes for disabled veterans. Hive – Offers a series of interconnected smart devices that can be integrated with one another to create an end-to-end smart home living environment. 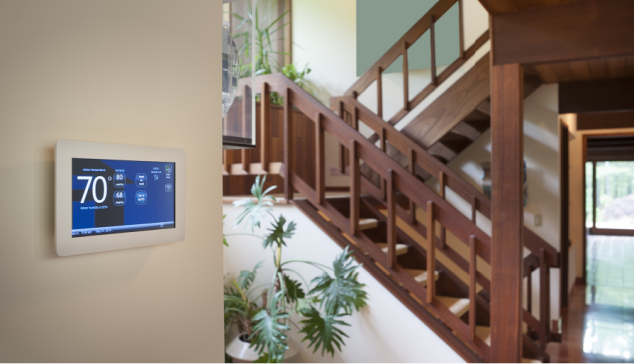 Hive products can be retrofitted into existing homes, or installed into custom builds. What Does the Future Hold for Smart Home Automation? If you can dream it, it may be part of the next wave of smart home automation. An area where smart home developers are focusing is on personalizing the home experiences through the use of wearable devices. Technology is improving that will make it affordable for the average American to have a personalized home experience like that of Bill Gates. In the not too far future, each room of your house may adjust to accommodate your needs and personal preferences. If you prefer the lights in your kitchen to be on the brightest setting, they’ll adjust when you walk in the room. If you haven’t gotten enough sleep, the information will be sent to a doctor or caregiver for consultation. If your laundry needs to be washed, the washer will start itself. With each advancement, life will become easier and more manageable for those who face physical limitations. For the disabled, such conveniences will continue to improve their quality of life, and allow them to remain in their home sweet (smart) home. Smart home technologies are good for everyone, but it will be more convenient for aging people as they don’t have to apply more energy for their day to day activities.